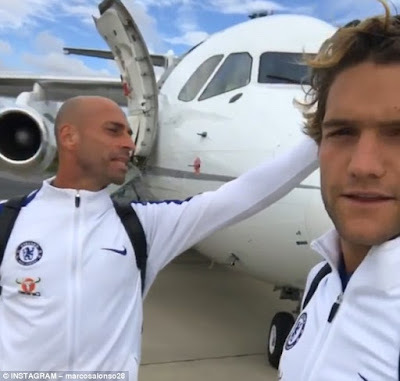 Chelsea's stars enjoyed a brief flight on Friday as the club took the unusual step of travelling to their away game at Leicester via aeroplane. 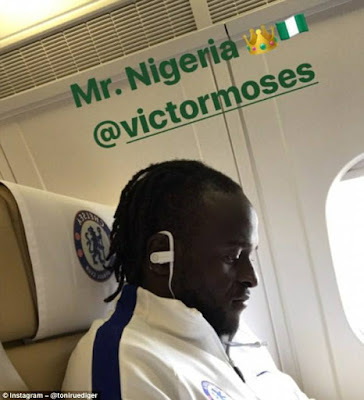 Eden Hazard, Michy Batshuayi, Victor Moses and Co posed for photos on board the chartered jet as the squad prepared for take-off. Chelsea have chosen to fly to Leicester ahead of Saturday's Premier League clash - despite just 102 miles separating Stamford Bridge and the King Power Stadium. Chelsea are set to welcome Hazard back into the fold with the Belgian in contention to feature for his club for the first time this season. 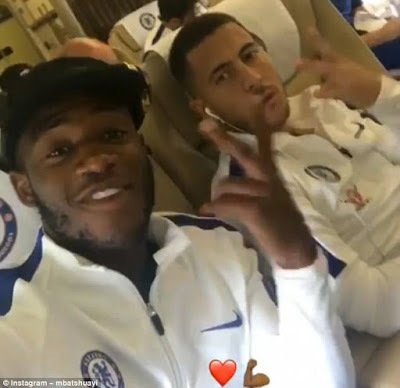 Hazard played twice for Belgium over the international break and has been training with the Chelsea first team after recovering from a fractured ankle suffered in June. It means Antonio Conte has a full squad to choose from - with new signings Danny Drinkwater and Davide Zappacosta in contention to make their Chelsea debuts.